Using consistent styles across campus helps our communications work better together. Bowdoin's colors are black and white, and we sport them with pride: on our uniforms and sweatshirts, in our decorations, and across our campus signage. But Bowdoin itself is a very vibrant place—our natural surroundings change daily and remind us just how lucky we are to live in Maine. If you're seeking accents or callouts for your own work, the color swatches below are meant to get you started. They are darker tones, which means there's enough contrast that you can use them for text. If they're used as a background, text on top should be white and sized above 16px. If you need more detailed usage requirements, or specifications for coated vs. uncoated papers, please reach out—we're happy to help! The Mrs Eaves, Mrs Eaves XL, Mr Eaves XL Sans, and Mr Eaves XL Sans Narrow font families are the primary typefaces for Bowdoin College communications. 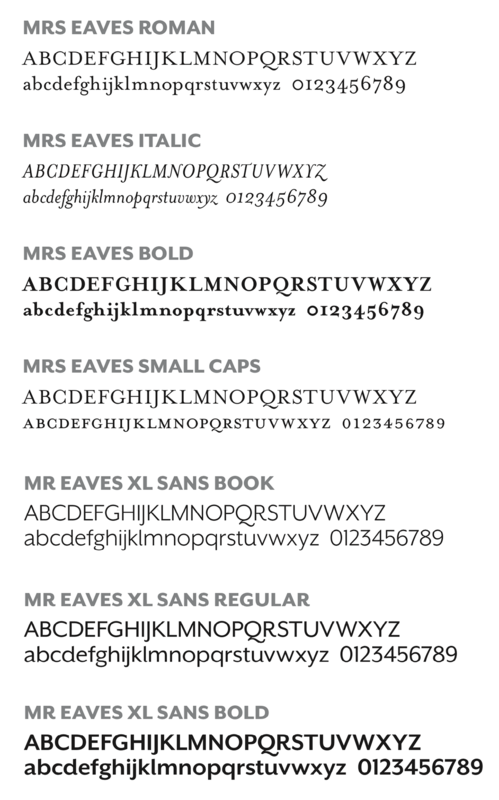 Mrs Eaves was chosen for its relationship to the wordmark, and Mr Eaves XL Sans was chosen as a sans-serif companion. Within each of these families, a wide range of styles and weights are available for use. The combination of these complementary families allows for flexibility and creative expression in text and display. Your website text will be converted to Mr. Eaves Sans on page save—bold and italic variations are also available. Use of primary typefaces is always preferred, but when primary typefaces are not available approved substitutes may be used. Times New Roman, a serif, is an acceptable substitute when Mrs Eaves and Mrs Eaves XL are not available. Arial, a sans-serif, is an acceptable substitute when Mr Eaves XL Sans is not available. Times New Roman and Arial are widely available and commonly installed on most computers. They are the only two substitute typefaces that are approved for use in PowerPoint templates, websites, email templates, informal internal communications, written letters, and others instances when the primary typefaces are not available.